ABS- EVERYONE WANTS THEM, NOT EVERYONE CAN WORK ON THEM. So I’m in the gym trying to find my ever elusive abs again and I keep thinking is everyone doing this; working tirelessly to be fit. Sometimes it works, and other times it doesn’t. Some days I’m good and other days, well, just bad. Though those bad days can’t be fixed, the team at Allston Collision Center, Inc. can fix Aluminum, Bronze and Steel, the other kind of ABS. Vehicles like Tesla, BMW, Mercedes Benz, Range Rover, Audi, Porsche, and the Ford F-150 are all built primarily with aluminum. Aluminum offers a lighter weight vehicle which assists with gas mileage and aerodynamics. It also makes for specialized repair work. In 2016, when Allston Collision Center, Inc. purchased the Multi-Mig 522, I thought the future was trending toward using more aluminum. Now in 2018, it seems I may have been right; more manufacturers are using aluminum including Toyota, Nissan and ACC recently worked on a 2010 Saab with an aluminum hood. 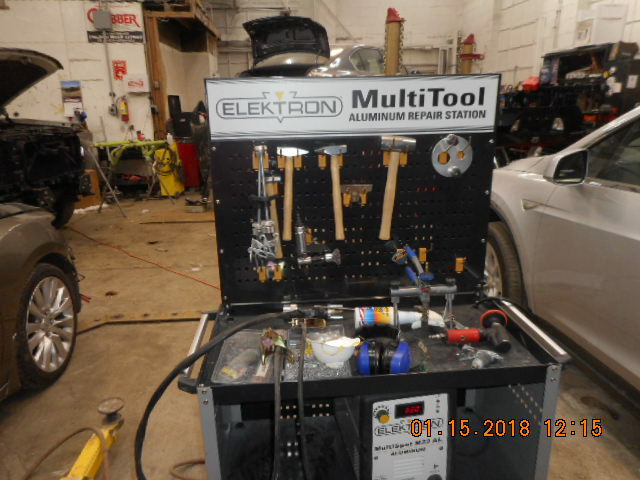 Similar to my thinking on going with water-based paint processes, I believe investing in the Multi-Mig 522 and keeping technicians on the newest trends will keep Allston Collision Center on par with car manufacturers as well as looking to the future. Not only are ACC technicians proficient in aluminum but they work on mixed metal vehicles, so our techs cover every car made. If you want more information on ABS, Aluminum, Steel, and Bronze that is, you can look up my earlier blog on our website. ABS also stands for Automatic Braking System and guess what Allston Collision Center can work on these ABS too. We are a full-service body shop which includes mechanical work. The team works with each customer to make sure their job is done right. Maybe you need a tow or a rental car – our team works with you, the customer, to get all the details covered. Allston Collision Center’s strategy is to use all our combined knowledge to help make an accident as painless as possible. Well, in the end, ACC can’t make anyone, including me, go to the gym to get you washboard abs, but we’ll do all we can to fix your other ABS!